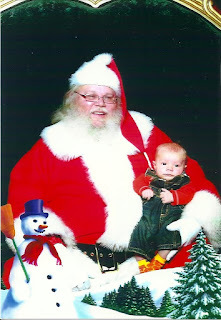 Will was about two months old, and we visited Santa at the mall in Madison, Wisconsin. 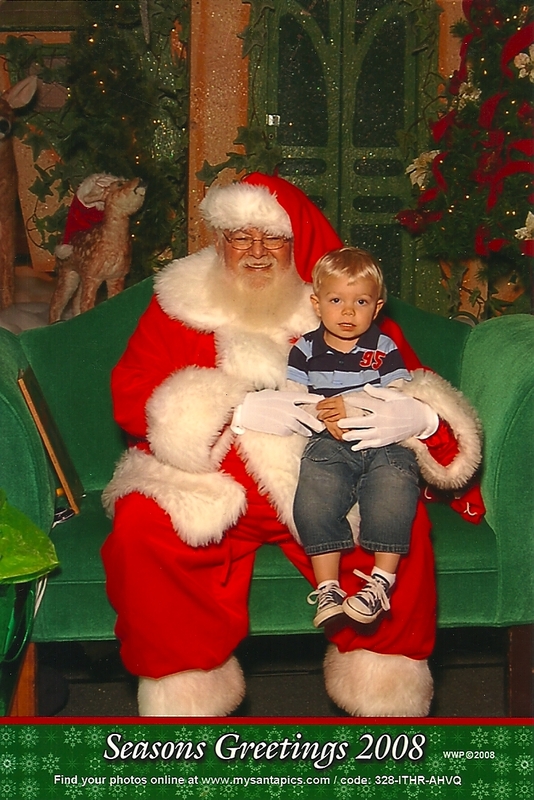 Santa looked kind of creepy, but Will didn't seem to mind. 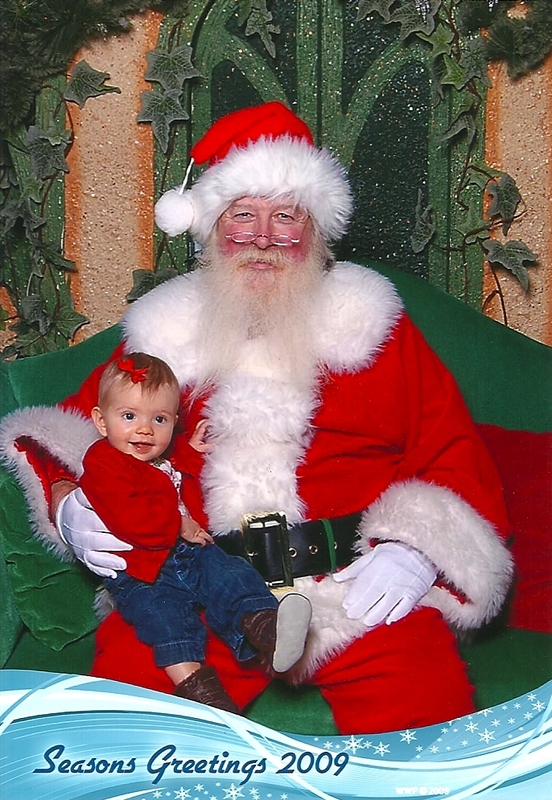 Will was just over a year old, and we visited the same Santa in Madison. Santa looked as creepy as he'd looked the previous year, and while Will wasn't scared of Santa, he was less-than-interested in sitting on his lap and/or smiling for the camera. 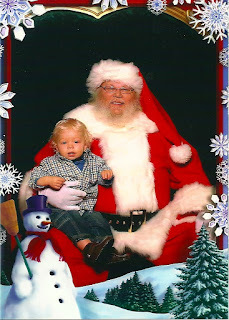 Will was two years old, and we visited Santa at the mall in Ann Arbor, Michigan. Santa in Ann Arbor came across as considerably more pleasant than Santa in Madison, and while Will chose not to smile, he enjoyed the experience…and the candy cane bribe handed to him as he climbed down from Santa's lap. 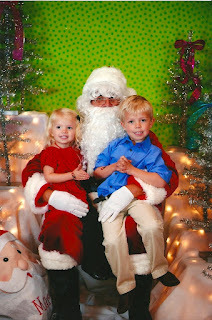 Will was three years and Hallie was eight months old, and we visited Santa in Ann Arbor once again. Hallie found Santa funny and cuddly, but Will had the mother of all meltdowns and refused to go anywhere near him (that day happened to be one of the only times in Will's life when he wouldn't respond to bribes) which is why our 2009 picture includes only Hallie. She looks adorable though, right? Will was six and Hallie was three-and-a-half years old, and they once again visited Santa at their (then only Hallie's) preschool's Dinner with Santa fundraising event. It seemed they finally had the hang of the process, as they both waited their turn, introduced themselves to Santa, told him what they wanted for Christmas, climbed into his lap, smiled for the camera, and bid Santa farewell...without any prompting from me. They seemed so grown up. 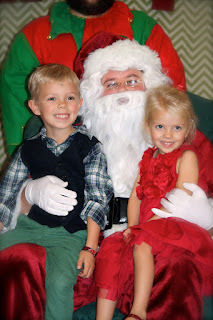 Will was seven and Hallie was four-and-a-half years old, and for the third year in a row we visited Santa at the annual preschool fundraiser. 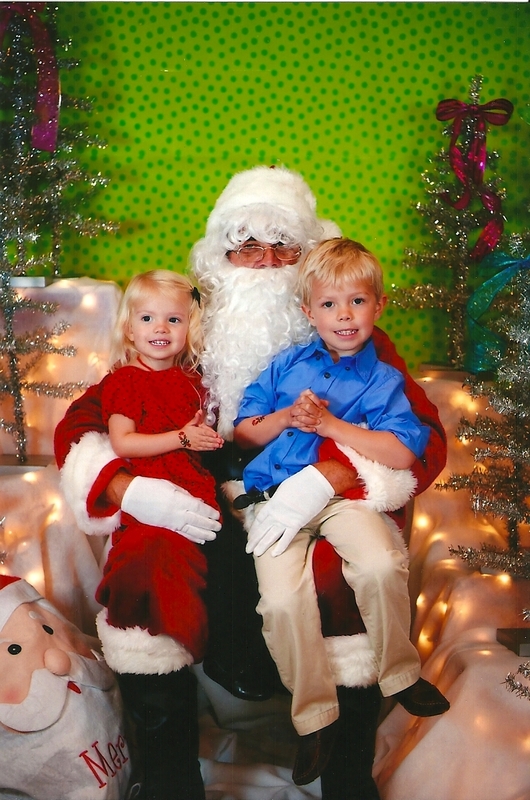 It appears neither child had grown much since the previous Christmas, given that both are wearing the exact same outfit they had worn the year before. 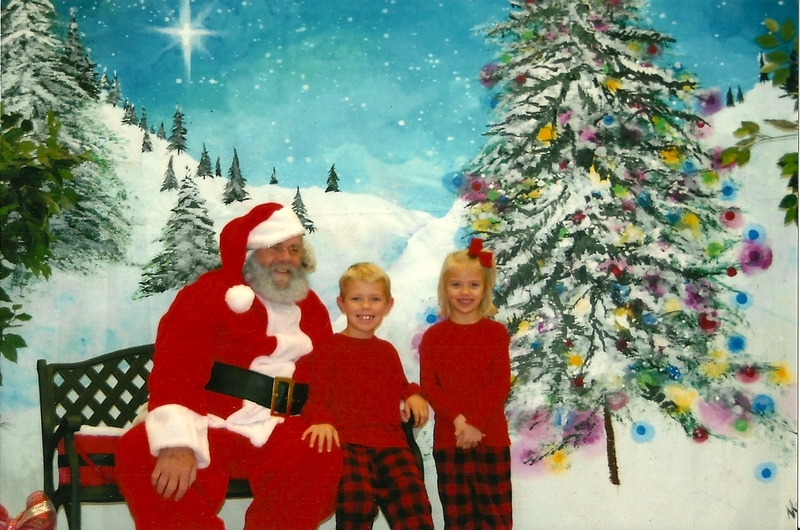 This picture is my absolute favorite - Will and Hallie's beautiful, natural smiles shine brightly, and Santa looks incredibly authentic. 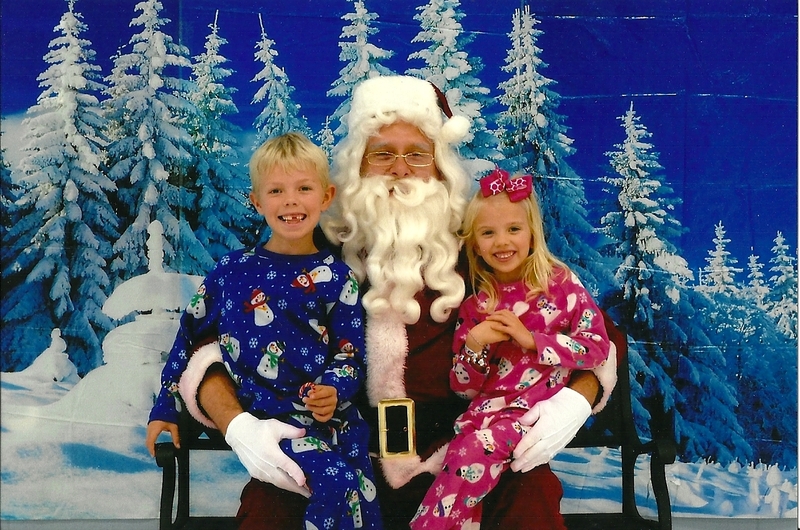 Will was eight and Hallie was five-and-a-half years old, and since Hallie had finally graduated from preschool, we visited Santa at the kids' elementary school's Pancake and PJs breakfast. This is my second favorite picture - Will and Hallie are once again flashing natural smiles (especially Will, with his adorably gap-y grin), their pajamas coordinated beautifully both with each other's and with the backdrop, and Hallie was having a really good hair day. Will is now nine and Hallie is six-and-a-half years old, and we once again visited Santa at Pancakes and PJs. 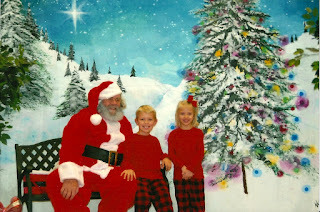 This year's backdrop was my favorite by far and the kids really enjoyed "this" Santa (apparently he told fantastically funny jokes), but I wish I could see the kids faces more clearly and that Hallie was integrated into the picture a little better. Funny story about this year's pajamas…Will chose these lumberjack (as I choose to call them) pajama pants and I picked up the red shirt just so he'd have something to wear with the pants on chilly nights. ("I won't need it, Mom. You know I'm never cold.") Hallie begged for a matching set and for 10 minutes I tried to talk her out of it, not because the pants and shirt came from the boys section, but because absolutely everything in the boys section is at least two sizes too big for her. I had to shrink the daylights out of the shirt, and to wear the pants she has to cinch the waist to half its resting size. She couldn't care less that neither fit her at all - she LOVES matching her big brother.